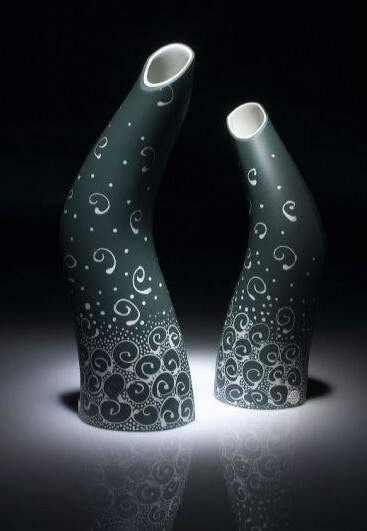 The type of work I am interested in making is primarily driven by the medium of clay and the ceramics process (my favoured process is slip-casting) very often in conjunction with other materials and techniques, depending on whether the outcomes are intended as ‘earners’ or ‘learners’. ‘Earners’ are best described as those products I make as a limited edition range for regular sales to specific outlets, such as Handmark Gallery and The Design Centre – Handmark Gallery is situated both in Hobart and Evandale, and The Design Centre is in Launceston. These include a range I call Australian Aspects. 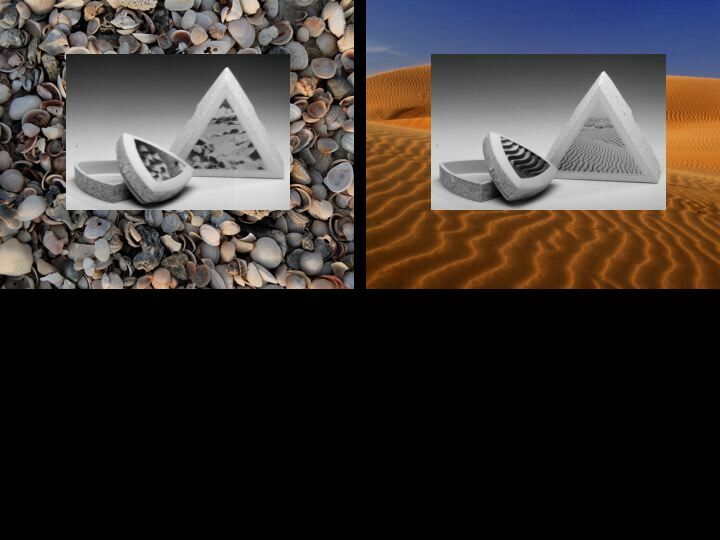 They comprise of slip cast porcelain lidded boxes in recycled packaging that reflect the variety of Australia’s diverse environment through abstract pattern and texture. 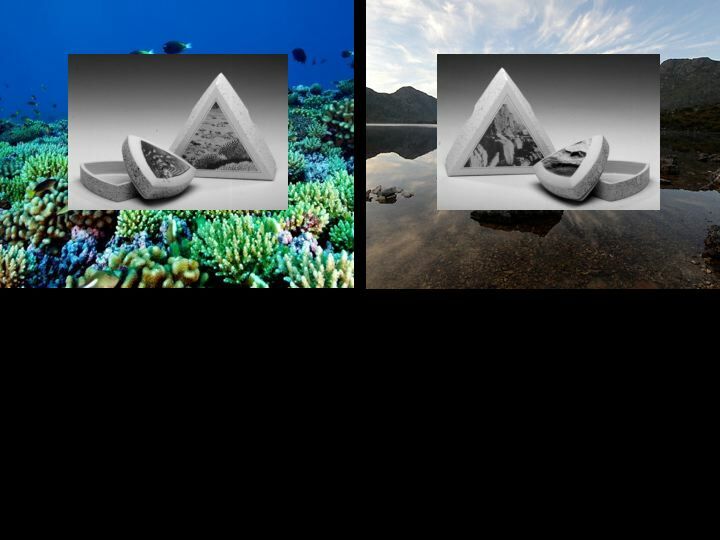 The themes depicted are The Forests and Rivers….. ……..the Reefs and the Mountains…… ……….and the Beaches and Deserts. Other limited edition products include a line of packaged porcelain jugs, lidded boxes, vases and dishes. The packages were designed by Inkpot Studios, Hobart. In addition to the limited edition ranges I produce, there are also those projects that I work collaboratively on with others, in particular my partner John, a furniture designer-maker. Very often these are architectural projects that have been contracted through Arts Tasmania, under the Tasmanian Government’s Art Site Scheme. 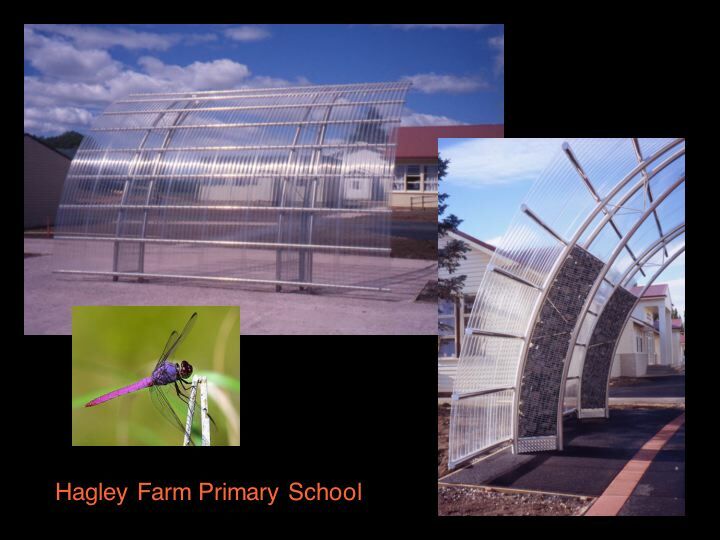 Hagley Farm Primary School, for instance, required sculptural shelters for the kids. We based our designs on a combination of nature, agricultural influences and the tradition of gabion wall building. This latter usually associated with reinforcing cuttings in road building. 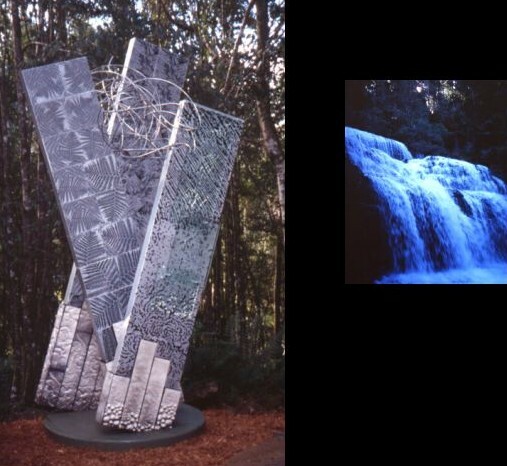 On occasions, we have also undertaken other public sculptures in collaboration with print-maker Milan Milojevic, a friend and college, in this instance, a piece inspired by Liffey Falls – an in situ piece for the walking track into Liffey Falls State Reserve on the slopes of the Great Western Tiers in the north of the State. 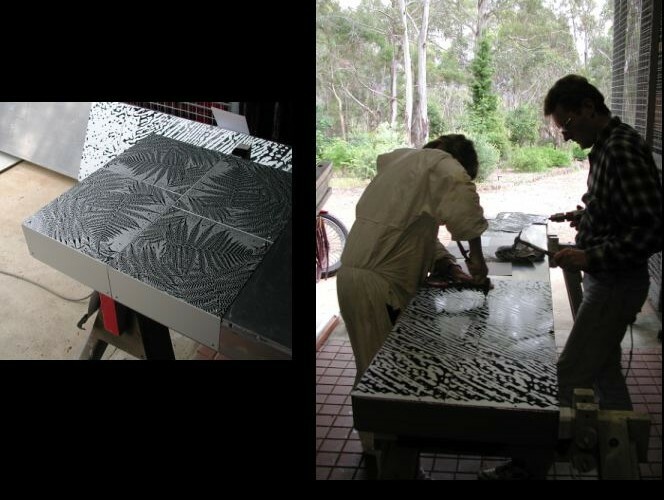 John and I did much of the preliminary work on the sculpture at our Mount Nelson studio. ‘Learners’ on the other hand are the R & D (research and development) side of ones practice. 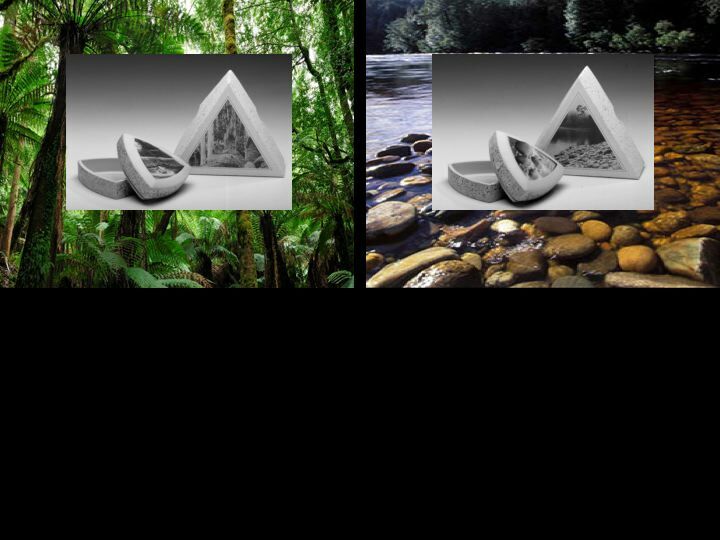 In this case, the work is speculative – usually one-off type pieces, where a particular idea or theme can be explored. It can also take the form of technical experimentation, where failure may well be the outcome, but lessons can be learnt for future work. Most of this type of work is usually for exhibition. 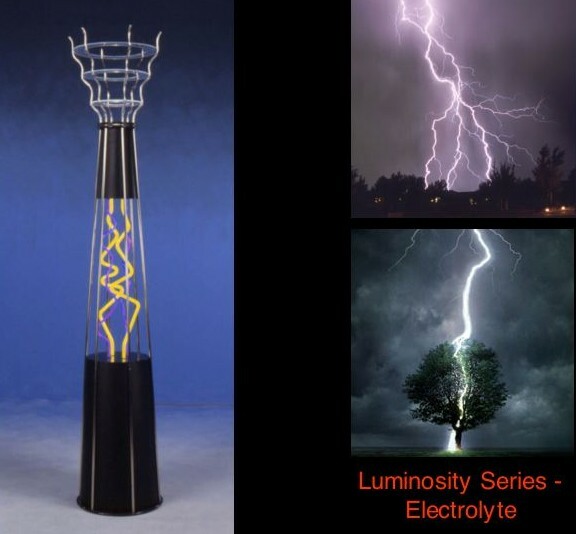 The following are a series of lights (and the inspirations behind their designs) by Penny and John. 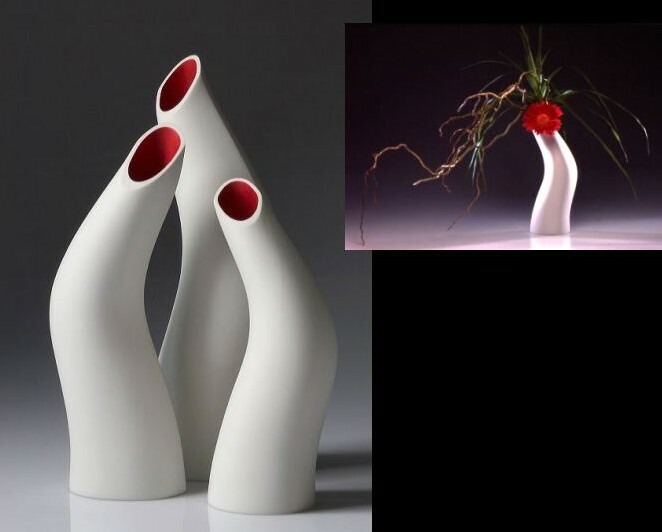 And a series of slipcast porcelain vases carrying the theme from ‘fire’……….. ………..to ‘ice’. 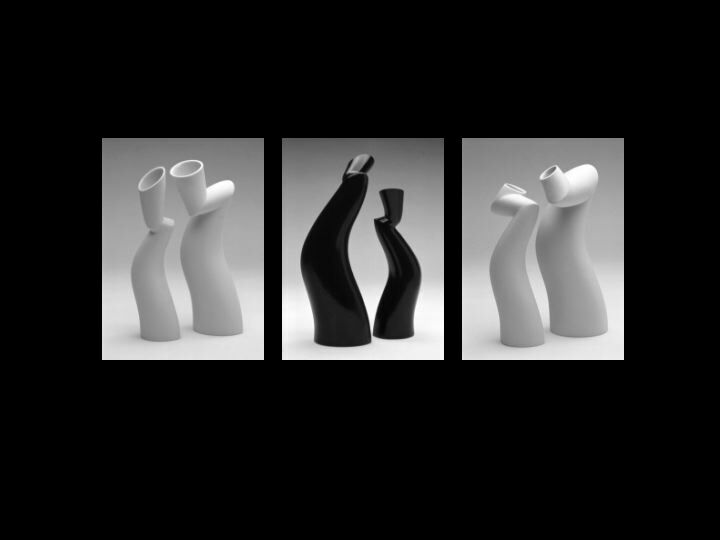 Porcelain series entitled Dialogues. love the images, looks like a glossy mag!